Before getting hands on experience in SQL server on failover cluster , I used to read many article about failover clustering. Unfortunately I was not able to digest the concept till I wet my hands.I will keep this point in my mind while explaining the failover cluster in this post. Network Load Balancing Cluster : A Network Load Balancing Cluster (NLB) distribute the load (request from the client) to the different nodes which are part of the cluster based on predefined rules.The client application has to communicate to a single cluster IP address (virtual server) and client does not know which node in the cluster exactly serving its request.Network Load Balancing cluster helps to enhance the the availability and scalability of application. We are not going to talk much about this on this post. Fail over Cluster: Failover cluster is a collection of servers that by working together increase the availability of applications and services that run on the cluster. It can be described as a technology that automatically allows one physical server to take over the tasks and responsibilities of another physical server that has failed.A failover cluster provides high availability for cluster aware application like SQL server ,exchange server,etc. The major difference between NLB cluster and failover cluster is, failover cluster will not help to improve the scalability of the application. It can only support high availability. There are many misunderstanding among people about the advantage of having SQL server on a failover cluster environment. Below table will give a clear picture about the capability of SQL server on cluster environment. To understand the failover cluster it is important to familiar with the terminologies. Let us have look on the terminologies used in the windows clustering. 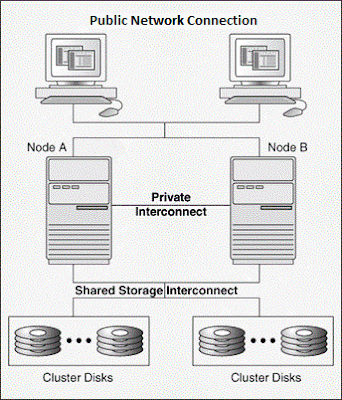 Server Node: Physical node with operating system that support windows clustering. Each server node should have minimum two network card for public and private network.Minimum one local hard disk is required for OS and other application binaries. Private Storage: Local disks are referred as private storage. There will be minimum of one private disk for OS and SQL binaries.Server node can have a additional local disk for bigger page file. Shared Disk Array: Each server needs to be attached to the shared external storage.In non-clustered SQL server instance, databases (system/user/resource) are store on locally attached disk storage but in clustered SQL server instances databases are store data on a shared disk array.That mean all the server nodes in the cluster setup are physically connected to the disk array.This shared storage configuration allow application to failover between server in the cluster. Quorum Disk: Quorum is the cluster's configuration file.This file (quorum.log) resides in the the quorum disk (one disk from shared disk array).Quorum is the main interpreter between all nodes. 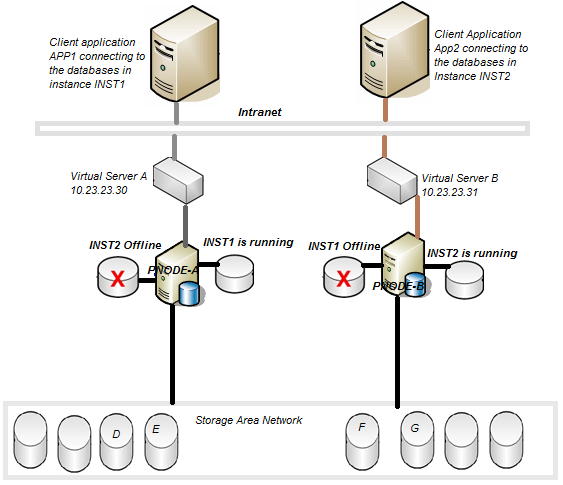 It stores latest cluster configuration and resource data. This helps the other nodes to take ownership when one node goes down. In real life, it is like emergency contact number and other medical information in your wallet which help others to take action in case of emergency. Public Network and Private Network: Each server needs at least two network cards. Typically, one is the public network and the other is a private network between the nodes. The private network is used for internal communication of cluster.This is referred as heart beat. Public network is used to connect the external world or intranet. Heart Beat: Heart beat is health check mechanism in cluster A single UDP packet sent between nodes in the cluster via the private network to confirm that nodes are still online. By default cluster service will wait five seconds(one heart beat sent in every second) before considering a cluster node to be unreachable. Looks Alive check:Looks alive check is a basic resource health check to verify that the service(SQL service in our context) is running properly.To perform this , cluster service queries the windows service control manager to check the status of the service.By default looks alive check will happen in every five seconds. Is Alive check: An exhaustive check to verify that a resource is running properly. If this check fails, the resource is moved offline and the failover process is triggered. During the Is alive check the cluster service connects to the SQL server instance and execute select @@SERVERNAME.It will check only the SQL server instance availability and does not check the availability of user databases. Failover: Clusters service monitor the health of the nodes in the cluster setup and the resources in the cluster. In the event of a server/resource failure, the cluster service re-starts the failed server's workload on one of the remaining servers based on possible owners settings. The process of detecting failures and restarting the application on another server in the cluster is known as failover . 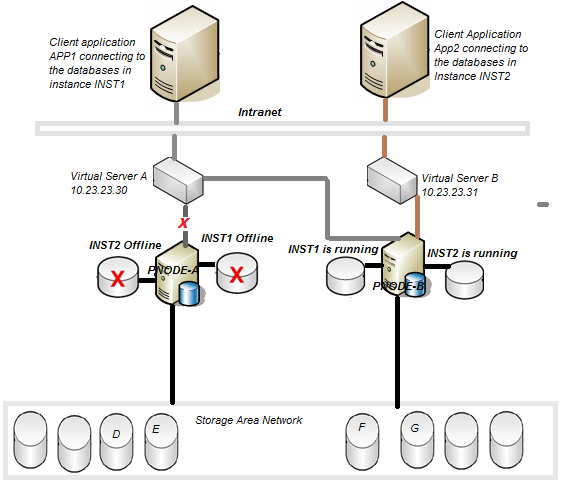 Virtual Server:Virtual server consist of a network name and IP address to which the client connect.This helps the client to connect the service which hosted in the cluster environment with out knowing the details of the server node on which the service is running.In simple word , virtual server helps the client application to connect the SQL server instance with out changing the connection string in case of failover of SQL instance. Preferred Owner: Preferred owner is the server node which best suited to running an application or group. Cluster Setup: Below schema diagram will give a clear picture about the windows cluster setup. This picture depicts two node cluster setup.At this stage Node A and Node B will have only OS and windows cluster service.One of the disk from cluster disk will be designated as the quorum disk. This setup basically done by windows administrators and storage specialists.On top of this, DBA's install and configure the SQL instances. We are not going talk about the SQL server installation on cluster environment on this post. To make it more clear, let us describe our cluster environment as given below. Let us look into the pictorial representation current setup. From the Fig-1, we can see that INST1 and INST2 are installed on both physical node , but at any point of time one instance will be online only in one node.At this stage INST1 is running on physical node Pnode-A and INST2 is running on node Pnode-B.The cluster disk D and E will be visible in the node Pnode-A and F and G will be visible in the node Pnode-B.The request from the App1 will be routed through the virtual server A and landed in Pnode-A where the INST1 is running.In the same way the request from the App2 will be routed through the virtual Server B and landed in Pnode-B where the INST2 is running. Let us see what will happen if there is a hardware/network failure in Pnode-A. Fig 2 depicts the failover of scenario of INST1 to Pnode-B. Now the INST1 went offline in Pnode-A and came online Pnode-B.The connection from the App1 will be routed through the same virtual Server A and landed in Pnode-B.All four cluster disk will be visible in Pnode-B and only C (Local disk) will be accessible from Pnode-A. 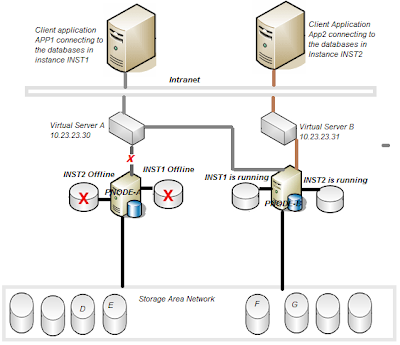 Note that even after the failover of INST1,App1 will be connecting to the virtual server A.It helps to make the failover transparent to the application. Nice post Nelson, keep it up! Your definition can lead to misinterpretation. "Working together as a unified computing resource" can lead to the interpretation or assumption that, given a two-node cluster, both physical servers will work together as a unified computing resource. Another way to say this would be that programs would have access to processors and RAM on both servers. Programs and services run on one and only one server on the cluster. If the cluster node is inaccessible, the programs/services running on the inaccessible node will be spun up on another cluster node. At no time will a service or program run across multiple nodes in the cluster. in the above you have not mentioned the values used for the Windows cluster. "All four cluster disk will be visible in Pnode-B and only C (Local disk) will be accessible from Pnode-A" --> This should be reflected in the graph. Thank you for the article. It describes things in very simple terms and it's a very good introductory article. I'm very new at this. Could you clarify exactly where the Virtual Servers are defined/set-up and how a virtual server may go down? What are the advantages of using clustering instead of availability groups? Such a nice article. Easy enough to understand. Very informative..keep up the good work. Its really good to know about that the procedure and the other key features mentioned here are quite considerable and most necessary as well, would be so far better idea to have these information to run the system in a systematic manner. Thank you for the article. Its really good, but i need some troubleshooting steps related to this articles. If for example nodeA goes down, With in few minutes noteA and noteB will be available in noteB. But my Query is how we will get back this NoteA to the original position and what are the basic steps that we need to be taken to get back the NodeA to the original position. Really appreciate the way, information is shared. Thanks a lot to you for the article. Its really good, and helpful for me to understand the basic concept regarding Clustering. The diagram is misleading and "The cluster disk D and E will be visible in the node Pnode-A and F and G will be visible in the node Pnode-B" is wrong. active at a time and is connected to shared disk storage. am speechless. It is a unbelievable weblog and very partaking too. Great work! That's probably not a lot coming from an beginner blogger like me, but it's all I may assume after having fun with your posts. Nice grammar and vocabulary. Not like different blogs. You actually know what you are speaking about too. So much that you made me want to learn more. Your blog has turn into a stepping stone for me, my fellow blogger. Thank you for the detailed journey. I actually enjoyed the 6 posts that I have learned so far. This design is incredible! most certainly know how to keep a reader entertained. Between your wit and your videos, I was almost moved to start my own blog (well, almost...HaHa!) Great job. I really enjoyed what you had to say, and more than that, how you presented it. Too cool! In SQL cluster environment, when we create sql jobs, do we need to create job on both nodes individually? No we will create it in only once (in an instance level not on node). Job is not part of the node it is part of the instance. Can you let me know how many IPs are required for cluster configuration , Minimum is 5 is there any max limit , if so for what all, can you explain me in detail regarding that. - Two IPs are for two Physical Nodes. - Two IPs are for Private network (for heart beats). Its very nice article, one query from my side , if the shared disk only fails what is the procedure and what is the best approach ? What is the network diagram software you used to create that network diagram ? Is it packet tracer or creately ? can we practice and install clustering on laptop in home ? just to get hands on experience ? i want to clustering setup on my home laptop, is it possible ? Thanks for such awesome blog. Your article is very easy to understand, informative and provide complete overview about software testing. Please consider including rss feed in your website, so I get your recent post on my site. This is extremely great information for these blog!! And Very good work. Excellent article,it was helpful to us to learn more and useful to teach others.This like valuable information is very interesting to read,thanks for sharing this impressive informative. Very Helpful Post And Explained Very Clearly About All the things.Very Helpful. Coming To Our Self We Provide Food Service Parts Through Out US At Very Affordable Prices And Also We Offer Same Day Shipping In US.We Offer Only Genuine Products.Really Thanks For Posting. Good article. It is very useful for me to learn and understand easily USMLE Thanks for posting. Thanks for taking time to share this SQL concepts. It is really helpful, continue sharing more like this. The information that you have shared was really very useful and looks great to see and thanks for sharing the information with us.